Blog : What's new ? In recent years, there has been increasing concern for safe long-term operation of existing European nuclear power plants. The ultrasonic inspection of corrosion resistant alloys used in these plants – in particular claddings, austenitic welds and cast austenitic steels – is a long standing issue in the field of nuclear non-destructive testing and evaluation (NDT and NDE). For these materials, a complex microstructure is responsible for both structural noise and attenuation, thus degrading the performance of ultrasonic non-destructive testing. At the same time plant owners wish to replace radiographic inspections by ultrasound as a less disruptive, safer and faster technique. To address these issues and thereby keep on improving safety and reliability of Generation II and III reactors, there are still a number of technical breakthroughs to overcome, including the need to improve NDE techniques for complex structured material. ADVISE (ADVanced Inspection of Complex StructurEs) is a collaborative research project awarded 4.17 Million Euro funding from the European Commission’s EURATOM programme under the Horizon 2020 framework programme for Research and Innovation. Started in September 2017 and lasting 4 years, the project is coordinated by Andreas SCHUMM (Electricité de France) and brings together a multidisciplinary team with complementary expertise of leading experts and key stakeholders covering construction, operation, and all aspects of in-service inspection. They will collaborate for new nuclear power constructions, maintenance of ageing power stations and safe operation of plants at end of life, addressing both Western European and Russian designs. The ADVISE consortium is made of 13 organisations from 6 European countries which include United Kingdom, France, Germany, Lithuania, Czech Republic and Hungary. The ADVISE project aims to enhance – and in some cases to enable for the first time – the ultrasonic inspection of complex structures materials in order to improve confidence in and reliability of the inspection of Generation II and III reactors. The project aspires to increase the comprehension and modelling of complex structures for accurate prediction, to develop new tools for material characterisation and to provide advanced inspection and defect evaluation methods as well as assisted diagnostics. ADVISE proposes a coordinated and novel approach which will enable the delivery of a set of techniques and methods answering the industrial and European endeavour to keep on improving and maintaining power plants safety and reliability across its territories. ADVISE will address the current inspection challenges by delivering documented capabilities for the identified classes of inspection problems, demonstrators on industrially relevant example cases and dedicated software tools. The main output of the project is a step change improvement in performance in terms of inspectable depth, defect detection and characterisation accuracy. For austeno-ferritic cast components, an increase of the inspectable depth of 70 to 85 mm is aimed for. Equally importantly, the in-situ characterisation for specific inspections will provide the confidence needed to make safe decisions from measured indications without the significant conservatism that is needed in many cases currently. The project leading to this application has received funding from the Euratom research and training programme 2014-2018 under grant agreement No 755500. 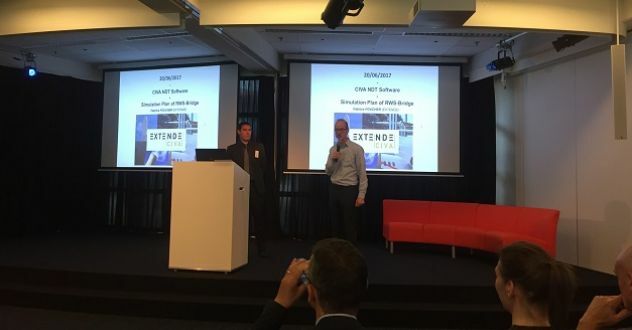 EXTENDE participated to the KINT conference in Hogeschool Utrecht from June 20th to 21st. During 2 days mixing presentations and workshops, we had an great overview of the future of NDT, new methodologies, new tools, and how virtual reality would help to perform NDT in near future. A key point was how digital technology will make teaching/learning NDT fun and efficient. EXTENDEpresented the simulations on a test case made for KINT group and RWS, on the modelling of a Phased-Array UT Sector-Scan inspection of a T-Weld profile. The main results of from this test case as well as an overview of the CIVA capabilities were presented to the participants. The final target of this project is to optimize bridge inspections. We thank the KINT team for the nice organization of this event. We believe that high quality and innovative Non Destructive Evaluation (NDE) will make our world a safer place and will help preserve the environment. Therefore, our mission is to bring the benefits of Simulation and NDE Development Methodology to the NDE Community. Stay updated about EXTENDE's news by subscribing to our Newsletter.